Disney's Beauty and the Beast is a live-action re-telling of the studio's animated classic which refashions the classic characters from the tale as old as time for a contemporary audience, staying true to the original music while updating the score with several new songs. "Beauty and the Beast" is the fantastic journey of Belle, a bright, beautiful and independent young woman who is taken prisoner by a beast in his castle. Despite her fears, she befriends the castle's enchanted staff and learns to look beyond the Beast's hideous exterior and realize the kind heart and soul of the true Prince within. When Disney announced they were making a live-action version of their animated classic Beauty and the Beast, I'm sure I'm not the only one who cringed at the idea. What could they possibly do to improve on the original? Well, the good news is that thanks to Director Bill Condon and a group of well-casted actors, this new version doesn't insult the original movie in any way, shape, or form. However, it also doesn't add anything of note. It's basically a well-made and quite watchable homage, but ultimately one we really didn't need. I'm going to make the assumption that most of the readers here are familiar with the story of the 1991 animated film, and won't rehash that here – just to say that this new movie mirrors that plot almost exactly. The difference in Condon's movie is that they've taken the story from the 84-minute animated movie and expanded on it with new background into characters and new songs to give this updated Beauty and the Beast a bloated running time of over two hours. Sadly, none of the new material works. The new story bits are largely uninteresting and none of the new songs hold a candle (pardon the pun, Lumiere) to the old 1991 songs that get reprised in this movie. The expanded plot now takes a look into the background of Belle's (Emma Watson) parentage, telling us more about her mother and giving her father (Kevin Kline) a much larger role than he had in the animated film. 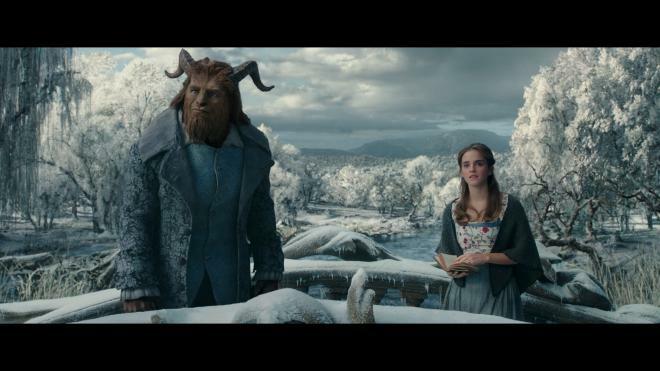 There's also some additional material covering the Beast (Dan Stevens, although mostly CGI throughout), as viewers learn that his mother died at a young age and his father didn't raise him right (which is why he got cursed in the first place). None of these segments nor the songs that accompany them add anything of importance or entertainment value to the original tale, and I'm sure I'm not the only one who found these bits of the movie to be rather flat and uninteresting. Where the movie really works is when it is mirroring the animated movie. Those old songs really hold up and the actors seem to be having a great time performing them. But that also results in another fault of this film: Condon is unwilling to take any risks with the 1991 material. Not only are many of the same lines from the characters in the animated movie carried over, but Condon remains slavishly loyal (as much as he can in a live-action movie) to the 1991 version. So when we get big song numbers like "Be Our Guest" or "Beauty and the Beast", they look almost exactly the same as their 1991 counterparts. In fact, there's even framing of characters to remind the audience of the same visual that the animated movie had. It's like the director has given the audience warmed-up leftovers the day after a holiday meal – it still tastes good, but it's not quite as fresh or as savory as it was the first time around. Beauty and the Beast is a beautiful looking movie (in fact, it's hard to imagine Production Designer Sarah Greenwood not getting an Oscar nod for her work here), and the actors are charming in it, but was it necessary? Someone who has never watched Disney's animated version would probably enjoy this quite a bit, but it's hard for me to understand why anyone would choose this new version over the 1991 classic. About the best thing I can say about this Beauty and the Beast is that it does nothing to tarnish the movie it's based upon, but it doesn't have much new to say, either. Its biggest achievement, perhaps, is reminding us all of how perfect the 1991 movie was...and still is. 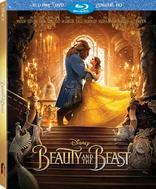 Beauty and the Beast arrives on home video from Disney in this Blu-ray/DVD/Digital HD combo pack. The 50GB Blu-ray and dual-layer DVD are housed inside an eco-Lite Vortex keepcase, along with a sealed insert containing the code for a digital copy of the movie, as well as a second insert advertising Disney's Movie Club. A slightly embossed slipcover with artwork matching that of the keepcase slides overtop. Upon playing the Blu-ray, you'll be first asked to make a language selection between English, English Descriptive Audio, French, or Spanish. Your audio selection can be changed once you get to the main menu. Both the Blu-ray and the DVD are front-loaded with short trailers for Cars 3 and Descendants 2. The main menu consists of a montage of footage from the movie, with menu selections across the bottom of the screen. In addition to this combo pack release, there are a couple of retailer exclusives out there to be found. Best Buy is offering a steelbook version, while Target is offering a version that comes with a 32-page storybook. I also recommend buyers of any of these combo packs redeem their digital code using the Vudu website, as owning the movie on that streaming service will give access to a few bonus materials that aren't available on this disc, the most notable being a feature-length commentary track with Director Bill Condon. 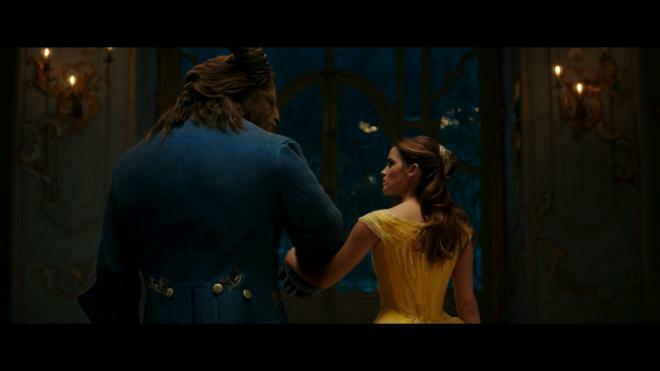 Beauty and the Beast was shot digitally on the Arri Alexa XT Plus and is presented on home video at the 2.40:1 aspect ratio with an AVC MPEG-4 codec. In terms of what 1080p can offer on home video, it doesn't get much better (if at all) than what viewers are treated to here. This is a stunningly beautiful transfer, full of lush colors, details, and a razor-sharp image. A lot of Beauty and the Beast either takes place at night or in the darkened passageways of the Beast's castle (or both), so going into this, black levels and noise were a big concern. However, I'm happy to report that the black levels here are deep and inky, and noise is kept to a bare minimum and is virtually non-existent in most scenes. Facial features are well-defined and skin tones consistent. I almost always spot aliasing in digitally shot movies transferred to Blu-ray, but my eyes didn't notice any here. Other frequently seen issues like banding are also nowhere to be found. As a bit of a side note, there have been some rumors lately that Disney is finally going to get into the Ultra HD game. If there's any truth to that, Beauty and the Beast should be one of the first titles they release. It's hard to imagine it looking much better than it does here, but I want to see that version. That said, what we get on Blu-ray is reference-quality stuff, and no one should be disappointed with this transfer – it's gorgeous. The featured audio on this release is an English 7.1 DTS-HD Master Audio track, and while it didn't quite blow me out of the water the way the video quality did, this is still a very good aural rendering with very little in the way of complaints. The audio makes excellent use of the surrounds without being too overbearing throughout the movie. One can hear the sounds of horses galloping, thunder in the distance, and the murmuring of the surrounding townsfolk – all of which help the soundtrack provide a immersive feeling at times. But, of course, when the audio really comes to life is during the musical numbers in the movie, which take advantage of virtually the full dynamic range that a 7.1 lossless track can provide. As for the spoken word, the audio is largely front and center, but clear and not overmixed with the rest of the track. I can't quite give the audio a reference-quality score, but it's pretty close, with no noticeable glitches to speak of. In addition to the lossless English track, 5.1 Dolby Digital tracks are available in both Spanish and French, as well as a 2.0 Descriptive Audio track. Subtitles are an option in English SDH, Spanish, and French. Note: In addition to the bonus features listed below, viewers are given three different ways to view the movie: the standard movie, the standard movie including an Overture, and a sing-along version of the movie, with song lyrics appearing at the bottom of the screen. Beauty and the Beast Music Video (HD 4:02) – Ariana Grande and John Legend do an okay rendering of the movie's theme, although for my money, I'll take Angela Lansbury any day over these two. We can argue until the last rose petal falls whether Beauty and the Beast needed a live-action remake, but the filmmakers and actors at least deserve credit for not ruining anyone's memory of what is arguably Disney's best animated film. Despite some of my problems with the movie itself, this Blu-ray release features reference-quality video and an almost equally impressive audio track – both of which will show off one's home theater setup. Recommended.